At 2.5 m (8 ft.) tall, the ostrich is the world’s largest and heaviest bird. Its significant weight, up to 145 kg (320 lb. 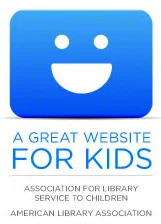 ), prohibits the bird from taking flight. 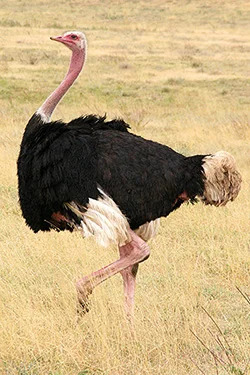 But the ostrich has many unique abilities that make it well-adapted to living in the savanna, desert, and open woodlands of central and southern Africa. The ostrich is equipped with long, muscular legs built for running. Unlike other birds, who have three or four toes, ostriches have only two toes on each foot which allows for greater speed. They can sprint as fast as 70 km/h (43 mph) and hold steady speeds of 50 km/h (31 mph). One stride can span 3-5 m (10-16 ft.)! When confronted with danger, ostriches can usually outrun any animals posing a threat. If fleeing the scene is not an option, ostriches use their powerful legs to kick. With a 10-cm (4-in.) talon on each foot, their downward kicks can cause serious harm to potential predators. 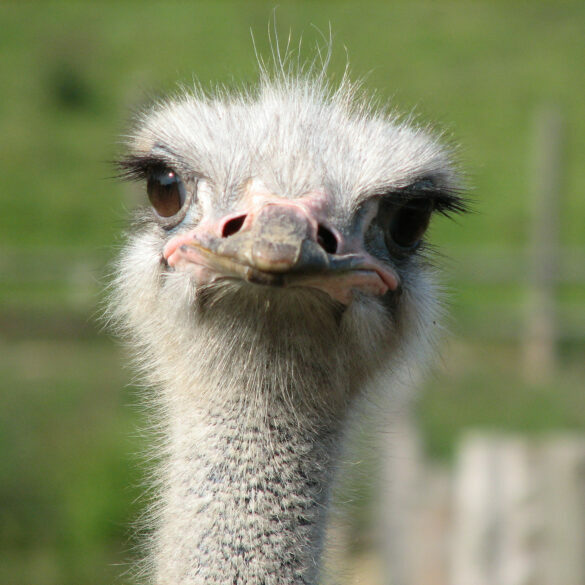 Despite popular belief, ostriches do not stick their heads in the sand when threatened. Sometimes ostriches flop on the ground with their heads outstretched in front of them. The pink/peach/grey coloring can blend in with the sandy ground making it appear like their heads are buried. Because the ostrich has an elongated neck and large protruding eyes shadowed by long lashes, it has been likened to a camel. (Its scientific name is Struthio camelus!) But the similarities do not end there. 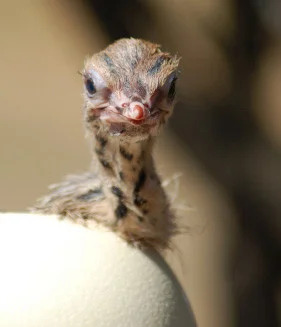 Ostriches can also withstand hot temperatures and go for long periods of time without water, usually getting enough moisture from the plants they eat. Their diet consists mainly of roots, leaves, and seeds, but ostriches will eat whatever is available. Sometimes they consume insects, snakes, lizards, and rodents. They also swallow sand and pebbles which help them grind up their food in their gizzard, a specialized, muscular stomach. Because ostriches have this ability to grind food, they can eat things that other animals cannot digest. Oftentimes groups of ostriches will graze among giraffes, zebras, gnus, and antelopes. Their presence is useful because they alert other animals when danger is near. Ostriches generally live together in groups of about ten, led by a dominant male and a dominant female. The dominant male defends the territory. His warning call is loud and deep. From far away, it can be mistaken for a lion’s roar. Ostriches also hiss to show their disapproval. During breeding season (March to September), the dominant male performs a ritualized courtship dance by shaking his wings and tail feathers. If the main hen is impressed, the two will mate. The other hens in the group may also mate with the dominant male or with other lesser males. Then the dominant male scratches out a shallow pit in the dirt to create a nest. The dominant female will lay around 7-10 eggs in the center of the nest, and the other females place their eggs to the outside. The communal nest may have as many as 60 eggs in it! 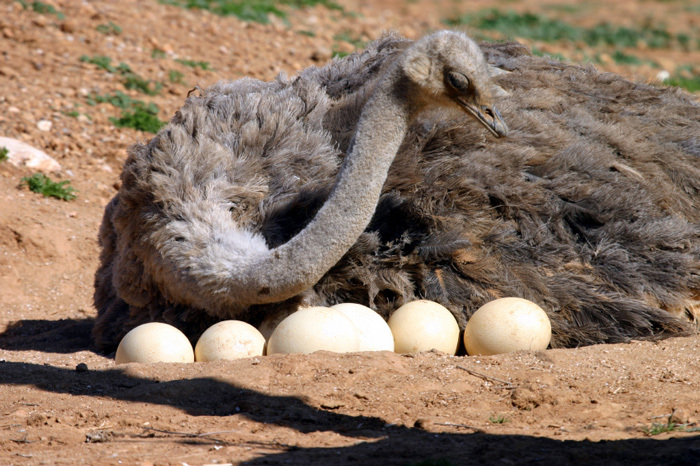 Both the male and female ostriches take turns incubating the eggs. Each egg is 15 cm (6 in.) long and weighs 1.5 kg (3 lb.). Ostrich eggs are the largest in the world! 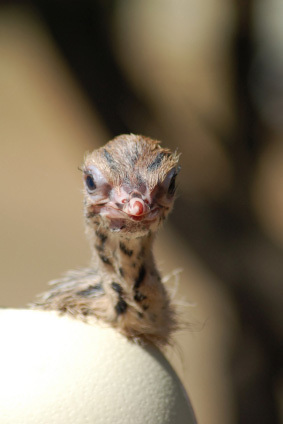 If the eggs are kept safe from hyenas, jackals, and Egyptian vultures, they hatch after around 6 weeks. The chicks are born about the size of a chicken and grow 30 cm (1 ft.) each month! By six months, the young ostriches have grown nearly as tall as their parents. Although chicks can run as fast as 55 km/h (35 mph) at one month old, they are still fairly vulnerable to predators like cheetahs, lions, leopards, hunting dogs, and hyenas. When confronted, adults will try to distract predators or lure them away. Chicks are born with a spiky, greyish-brown down. They grow brown feathers after 4 months. Then around 3-4 years, ostriches reach sexual maturity. Males develop a striking black and white plumage while females continue to have a brown plumage. In the wild, ostriches live around 40 years. In the 18th century, ostriches were nearly brought to extinction by hunting because their feathers were very fashionable in women’s clothing. 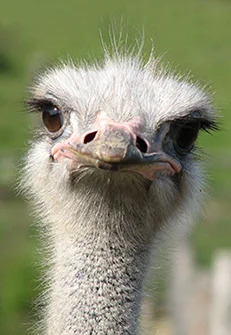 But by the mid 19th century, people started farming ostriches. This allowed farmers to simply pluck the feathers from their domesticated birds without having to kill them. Today, ostriches are classified as a species of least concern by the IUCN Red List. They have a large range, but their numbers are declining. 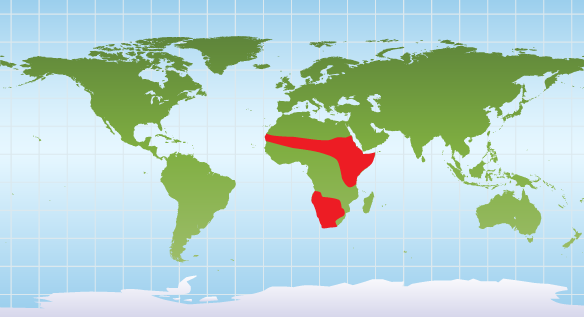 They are threatened by habitat loss due to human development and agriculture. They are also still hunted for their feathers, skin, meat, eggs, and fat. If you’d like to help ostriches, you can promote wildlife tourism in Africa. This encourages land conservation while creating jobs for the local community. 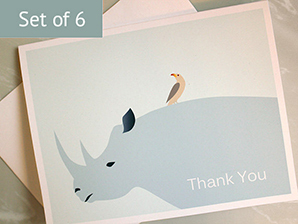 You can donate to organizations like the African Wildlife Foundation which supports eco-tourism projects in the region. Ostriches inhabit the savanna, desert, and open woodlands of central and southern Africa.